C ooler water temperatures proved to be a bit of a problem for fishing in southwest Florida over the past couple of weeks but things are improving with a recent warming trend. The weather pattern is suppose to slide toward the 80 degree mark this coming week, so that should bump the bite up another notch. Despite the cooler water temperatures most species were still cooperating. Most notable were sheepshead. They have moved in to the backcountry waters of Estero Bay for their annual spawn and are eating just about anything we throw their way. Live shrimp has always been a go-to bait along with oysters and barnacles. The best bite has been in areas of good moving water around oyster bars and dock pilings. Remember to keep your bait offerings and tackle on the small side. Cover circle hooks with bait and use just enough weight to keep it on the bottom. Be patient and let them eat. Seatrout are on the move once again and seem to be congregated around mangrove islands in the open bay areas. The best bite and biggest fish were caught on points during inbound tides. Popping cork rigs baited with live shrimp have long been the tackle of choice for seatrout, but we did equally as well with jigs on the bottom and artificial Berkley Gulp Shrimp and D.O.A. Shrimp. When water temperatures warm to the mid 70’s be sure to get out those top water chuggers. 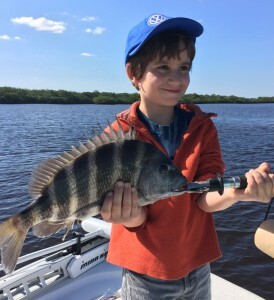 The redfish bite has picked back up and there is a nice mix of small to large ones in schools along the east wall of Estero Bay. The majority are in the 16 to 18 inch range but we’ve picked up a few top slot ones as well. Live shrimp on 1/4 ounce jig heads has worked best. Toss them close to the mangrove edge and then work them very slowly back to the boat. We’ve also been drifting corks with jig and shrimp combo’s in the current. Set up on a point, cast up stream and then let the cork do the work for you. The strike will usually happen near the point and those reds tend to be bigger. There’s a nice mix of fish in the creeks and rivers of Estero Bay with a focus on black drum. They have been eating shrimp and small crabs in the deeper cuts and holes. We’ve also gotten pompano, sheepshead and some small permit in the same area. Free line the baits on small circle hooks with no weight for the best bite. That will also keep your offerings out of the snags on the bottom. The nearshore waters of the Gulf have been alive with spanish mackerel and bonito. Head out about 2 miles and start looking for the birds working over schools of bait. Cast anything small and shiny in the area, work it quickly through the water, and you should hook up right away. A move to the rock piles and reefs just off of Fort Myers Beach will get you a nice mix of mangrove and lane snapper, seatrout and flounder. Work the sandy areas around the piles with jigs and live shrimp. Capt. Rob Modys is the owner of SoulMate Charters in Fort Myers, Florida and has been a charter captain since 2001. He’s been the host of Reel Talk Radio, a fishing based sports radio talk show on the local ESPN affiliate in Fort Myers since 2009. He also does public speaking about fishing and the great outdoors for clubs and events throughout southwest Florida and has been teaching fishing classes the past ten years for the Collier County Adult Education program in Naples, Florida. 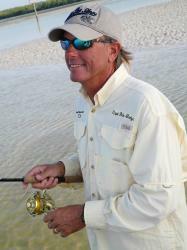 He was recently honored with a Best Guide in Lee County award from Gulfshore Life Magazine and is the current Vice President of the Florida Outdoor Writers Association and serves on the Board of Directors for the Florida Guides Association.